Growing loofahs is actually one of the easiest gardening things I’ve done. I know, it sounds kinda scary, right? Loofah. It sounds so exotic – and nobody grows them – so it must be hard right? Wait a minute, you can GROW LOOFAH? Don’t those come from the sea or something?? Nope, they are a wonderful vegetable, very similar to a squash or gourd. You can actually eat them! How about a batch of Loofah Muffins at your next potluck? You know you want to! But of course, they are best used as a scrubber. Check out my post here for more info on that! Growing loofah is as simple as dropping the seed in the ground and waiting for it to grow, then admiring the beautiful flowers and watching the fruit (the actual loofahs) grow! The loofah is not susceptible to any particular pests or maladies and seems to thrive in most soils. The picture below was a new garden bed for me and many of my plants in it did not grow that well that year (new beds often do not have the right nutrition) but the loofah took off! I didn’t lose any fruit to bugs or disease. Loofah plants need 100 frost free days. If your area does not have that long between frosts, then I recommend starting early indoors in a quart sized pot and transferring when the ground warms up. Loofahs do love a well fertilized soil. I recommend placing some compost or warm castings in with the seed. However, this is not totally necessary as you can see in my picture. I applied no additional fertilizer to the plant (aside from what I had amended the bed with) and it actually got TWICE the size of what you see in the picture. I had to start trimming it back because it was out of control! Loofahs absolutely require a trellis. This can be a privacy fence, chain link fence, cattle panel, garden lattice or any other strong support – its not picky. It will grow up other plants or scale the side of your house, lol. I put up a small (4’x4′) trellis for this one and it pretty much ate that for breakfast and kept going! At this point, it pretty much does its own thing. It will grow and eventually put out pretty yellow flowers. It is pollinated by bees, so if you do not have bees, you may need to hand pollinate it. 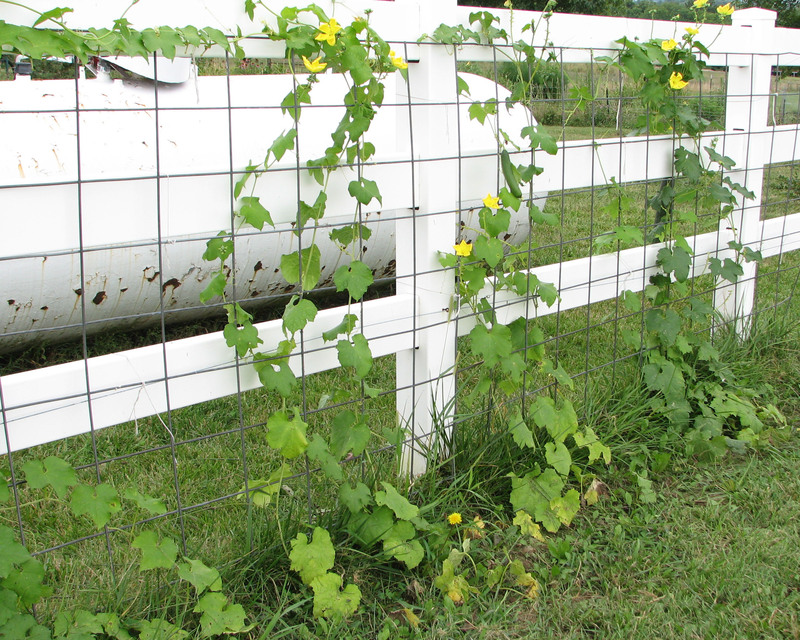 Feel free to trim off any stray vines that are going places you don’t want them to. It won’t miss them and will just put more effort into the rest of the plant. The flowers will give way to the loofah gourd, which will start out small and then grow and grow. The tiny baby loofahs look similar to the baby corn you get in Asian food and then as they grow they resemble a cucumber. The loofahs will start out tender and squishy and once they get larger and stop growing (usually around 2 ft long! ), they will start to harden and get hollow. This is a good thing! Leave them on the vine. Make sure that your loofahs are well ventilated or they can start to rot out. I always just made sure they had enough room on the trellis and were not suffocated by leaves or growing too close to another loofah. I had some grow low and were dragging the ground so I found ways to prop them up. Some of the loofahs will possible rot anyway, instead of drying out properly. Unfortunately that’s just the luck of gardening but you should still have plenty. Bring ALL loofahs in before the first frost. The frost will kill off the entire vine and will start the rot the fruit. One small frost may not harm them but I wouldn’t risk it. Once your loofahs have dried, pop back over to my other post on how to clean them and use them! This is the trellis we built for our loofahs this year. I will have a tutorial up soon on how to build one just like it! Or, of course, come up with something else creative! The loofah is a fun and easy plant to go with an amazing result! I recommend it for any home gardener, or even someone with just some extra space. What do you think? Would you ever grow loofah? ← C11 Clean All-Purpose Cleaner Review and Giveaway!